So, you want to document the parameters for your new Configuration Management Guide. Specify the name of the parameter with consideration to case sensitive naming conventions. Likewise, use the correct format and styling when entering parameters to your documents. 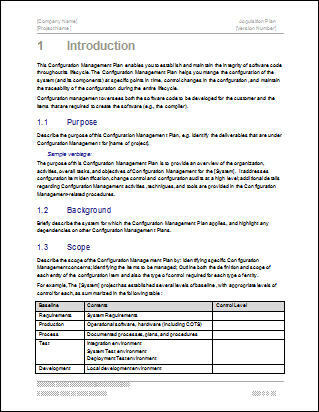 Download the Configuration Guide Template here. Specify where in the configuration file that parameter is located. For example, is it part of a specific parameter set or a section of common parameter setting? In this case, the Log parameters are part of a common set of parameters used by the service, server, or application. Describe the benefit to the user when this parameter is configured. Outline what it enables them to achieve and, if necessary, any downstream impacts. For example, if you turn on this option, other options are made unavailable. Defines a locally stored backup license file. This provides protection against interruptions occurring if the connection to the license server is lost. Defines if a new log file is created at the time specified by the Time parameter or when the current log file reaches the size specified by the Size parameter. Defines if messages are filtered according to the Filters parameter if the Verbosity level is set to comm. Describe the parameter options is the settings are turned on or off. For example, state which options are available and then describe the settings. True – describe what occurs if the True setting is selected, for example, enables statistics support. False – describe what occurs if the False setting is selected, for example, disable statistics support. Some parameters come with a default value, for example, 0, 1, Yes or No. Specify the default value so it’s clear to the reader if they need to change the setting or leave it in its default status. Use the following phrasing: This is the default value. Highlight if this setting impacts other parts of the system, for example, it overrides another parameter’s settings, disables another feature, or impacts the performance of the system. If necessary, direct the reader to other sources of information which may help them understand the parameter a little better. For example, if it impacts another module or system. State if the parameter is mandatory. The value of the parameter must match the value specified for the Metrics parameter. The value of the parameter must be equal or greater than the value of the TimePeriod parameter. 0 — no data is sent to the server. 1 — data is sent to the server as soon as it is collected. This value reduces performance. The first sentence describes the purpose of the parameter in a single sentence. False — disables statistics support. This is the default value. The skill in documenting parameters in technical documentation is to describe both the parameter and how it affects other settings, modules, or applications. This means, as a technical writer, you need to understand how it connects to other parts of the system. Without this knowledge, your documentation may be adequate but not help the reader understand its impact on other products. PS – Download the Configuration Guide Template here.